Chief Master Sergeant of the Air Force James Cody said yesterday that the upcoming Airman Comprehensive Assessment will be thorough and time-consuming, but will ultimately be worth it. The revised feedback form — which will be the first piece of a major overhaul of enlisted airmen’s evaluations — is still a few months away from being released, Cody said. It will include a self-assessment, a detailed performance evaluation, and questions for airmen and supervisors to discuss, he said. “The form facilitates a meaningful and purposeful dialogue between supervisors and the airmen they lead,” Cody said. Cody said that supervisors owe it to their airmen to give them clear and honest feedback. 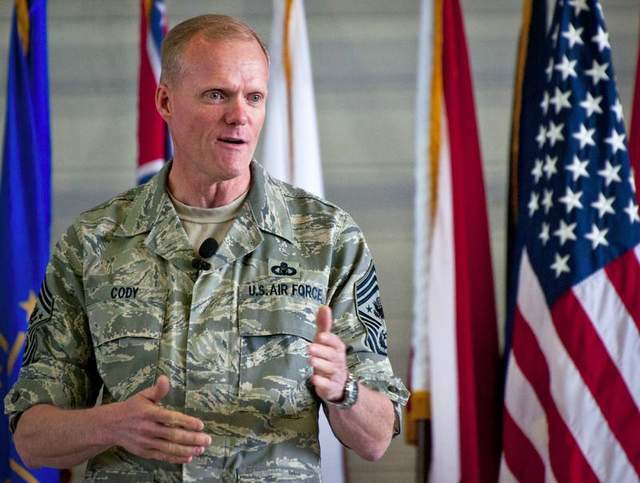 And airmen must truly listen to that feedback and act to fix their weaknesses to reach their full potential, he said. Cody said in a January video that as part of the new feedback form, supervisors will ask airmen about their finances, relationships, and other personal matters that could affect their careers in the Air Force. In the most recent Roll Call, Cody touched on that aspect of the feedback form.